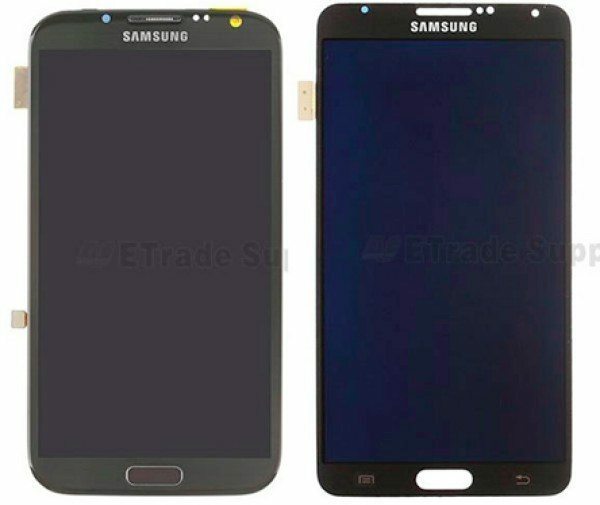 More details about the Samsung Galaxy Note 3 are emerging every day ahead of the launch, and yesterday we showed some leaked images that were claimed to be of the Note 3 display. The screen size seems virtually confirmed now at 5.68-inches, and today we have an image that depicts how the Samsung Galaxy Note 3 could achieve the same overall width size as the Note 2, despite having a larger display. News about the Samsung Galaxy S3 is rolling in thick and fast, and yesterday we heard about some reported improvements coming for the S Pen and video capture. Later the same day the leaked display panel images came to light. Since then we have seen further leaked images, with the source measuring the display size at 5.68-inches, as has been widely rumored previously. ETrade Supply also shows that the Note 3 looks to have slimmer bezels than the Note 2, at only 2.2mm. This indicates that the Note 3 could in fact be very similar in overall width to the Note 2, even with the bigger display. Further reinforcement of this has now turned up, with an image showing a manual construction of the purported display of the Note 3 alongside that of the Note 2. The image gives us an indication of the differences between the panels of the two devices, and you can see that although the display frame on the Note 3 appears longer than the Note 2, the width looks to be practically the same. The display size of the Note 2 is 5.5-inches while the Note 3 steps up to 5.68-inches, but you can see that the same width is achievable because of the reduction of the bezels. Of course, all of this depends on the current proliferation of leaked images being genuine, but it’s not too much longer now until September 4th when we now know that the Galaxy Note 3 will finally be officially announced. However, for those of you who want the Galaxy Note 3 with a larger display but not too much change in form size, this is promising news. Are you one of the many people waiting for the reveal of the Samsung Galaxy Note 3 Android smartphone? Tell us what you’re hoping to see in the way of specs, features and design by sending your comments. A screen you can comfortably see outside. Allow two stereo bluetooth headsets to listen to my phone or watch youtube at the same time. Come on Samsung, simple stuff to make a great upgrade.